Native American Facts For Kids was written for young people learning about the Arapahos for school or home-schooling reports. We encourage students and teachers to visit our main Arapaho website for in-depth information about the tribe, but here are our answers to the questions we are most often asked by children, with Arapaho pictures and links we believe are suitable for all ages. Photographs are the property of the sources we have credited. How do you pronounce the word "Arapaho"? What does it mean? Where do the Arapahos live? The Arapahos were far-ranging people, especially once they acquired horses. By the time the Americans met them they were living on the Great Plains in what is now Colorado, Wyoming, Nebraska and Kansas. Eventually the US government deported the Southern Arapaho tribe to Oklahoma, where they joined together with the Cheyenne. The Northern Arapaho tribe remains in Wyoming today. Here is a map of Arapaho tribal territories in the 1860's. How is the Arapaho Indian nation organized? There are two Arapaho tribes today. The Northern Arapahos live on a reservation, which is land that belongs to the tribe and is under their control. They share this reservation with the Shoshone. The Southern Arapahos live on trust land together with the Southern Cheyennes. Each Arapaho tribe has its own government, laws, police, and services, just like a small country. However, the Arapahos are also US citizens and must obey American law. In the past, Arapaho bands were led by traditional chiefs. The chief of each band was chosen by an Arapaho tribal council. Today, both Arapaho reservations are shared with Indians of other tribes. So now these communities have leaders who are elected by all the Indians who live there. What language do the Arapahos speak? Arapaho people speak English today. Some elders also speak their native Arapaho language. If you'd like to learn a few easy Arapaho words, "hebe" (pronounced "heh-beh") is a greeting used among men, "tous" (pronounced "tose") is a greeting used among women, and "hahou" (pronounced ha-ho) means "thank you." You can listen to some audio clips of the language here and see an Arapaho picture glossary here. Today Arapaho is an endangered language because most children aren't learning it anymore. Because the Arapaho tribes were merged into two other tribes who didn't understand Arapaho, it was very difficult for them to preserve their traditional language. However, some Arapaho people are still working to keep their language alive. What was Arapaho culture like in the past? What is it like now? Arapaho flag Here are links to the Cheyenne-Arapaho Tribes of Oklahoma and the Northern Arapaho Tribe. On their sites you can find information about the Northern and Southern Arapaho people in the past and today. How do Arapaho Indian children live, and what did they do in the past? Arapaho toy horse They do the same things all children do--play with each other, go to school and help around the house. Many Arapaho children like to go hunting and fishing with their fathers. In the past, Indian kids had more chores and less time to play, like early colonial children. But they did have dolls and toys, and they played games and sports like this hoop game. Arapaho mothers, like many Native Americans, traditionally carried their babies in cradle boards on their backs--a custom which many American parents have adopted now. What were Arapaho men and women's roles? tipi poles Arapaho women were in charge of the home. Besides cooking and cleaning, an Arapaho woman built her family's house and dragged the heavy posts with her whenever the tribe moved. Houses belonged to the women in the Arapaho tribe. Men were hunters and warriors, responsible for feeding and defending their families. Only men became Arapaho chiefs, but both genders took part in storytelling, artwork and music, and traditional medicine. What were Arapaho homes like in the past? Arapaho tipi Arapaho people lived in tall buffalo-hide houses called tipis (or teepees). Here are more tipi pictures. Tipis were carefully designed to set up and break down quickly. An entire Arapaho village could be packed up and ready to move within an hour. Originally tipis were only about 12 feet high, but after the Arapaho acquired horses, they began building them twice that size. Today, Native Americans only put up a tepee for fun or to connect with their heritage. Most Arapahos live in modern houses and apartment buildings, just like you. What was Arapaho clothing like? Did they wear feather headdresses and face paint? Arapaho woman Arapaho women wore split skirts or long buckskin dresses, and the men wore breechcloth and leggings. Shirts were not necessary in Arapaho culture, but women frequently wore mantles, and in battle or on special occasions, Arapaho warriors would wear special fringed shirts like this one. Sometimes the Arapaho decorated their clothing with beads, porcupine quills, or rows of elk's teeth (like the lady at the bottom.) Both genders wore moccasins on their feet and buffalo-hide robes to keep warm. Here is a site about the symbolism of Plains Indian war shirts, and some photographs and links about Native American clothing in general. Both Arapaho men and women wore their hair in two long braids, which they sometimes wrapped in fur. Traditionally, Arapaho men tied feathers to locks of their hair, and women occasionally painted their hair red. Here is a website with pictures of these Indian hairstyles. Later, some Arapaho warriors began wearing impressive feather headdresses like their neighbors the Sioux. Both genders painted their faces with bright colors for special occasions. Arapaho people used different patterns for war paint, religious ceremonies, and festive decoration. Today, some Arapahos still wear moccasins or a fringed shirt, but they wear modern clothes like jeans instead of breechcloths... and they only wear feathers in their hair on special occasions like a dance. What was Arapaho transportation like in the days before cars? Did they paddle canoes? Dog travois No--the Arapaho weren't coastal people, and rarely traveled by water. Sometimes they built rafts for crossing rivers. Most of the time, however, Arapaho people traveled overland. Originally they used dogs pulling travois (a kind of drag sled) to help them carry their belongings. Once Europeans introduced horses to North America, the Arapahos became known as expert riders and traveled greater distances. Horse riding is still popular in the Arapaho nation today, but like other Americans, Arapaho people also use modern vehicles like cars now. 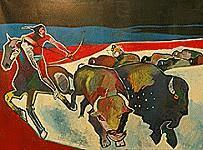 Cheyenne Arapaho bison hunt What was Arapaho food like in the days before supermarkets? Originally the Arapaho were corn farmers as well as hunters, but once they acquired horses they mostly gave up farming to follow the seasonal migrations of the buffalo herds. Most of their diet was meat, especially buffalo, elk and deer, which they cooked in pits or dried into jerky. The Arapahos also collected chokecherries, fruit, and roots to eat. Here is a website with more information about Plains Indian food. What were Arapaho weapons and tools like in the past? The most popular Arapaho weapon was the bow and arrow. The Arapahos were famous for their skill shooting arrows. Arapaho warriors also used spears and hide shields. Here is a website with pictures and more information about Native American weapon types. What other Native Americans did the Arapaho tribe interact with? The Arapahos traded regularly with all the tribes of the Great Plains, carrying goods between northern tribes like the Lakota and southern tribes like the Comanche. The Arapahos usually communicated with these tribes using the Plains Indian Sign Language. Their closest friends were the Cheyennes, with whom they often shared territory. The Arapaho and Cheyenne tribes are still important allies today. The Arapaho also fought wars with other tribes. Plains Indian tribes treated war differently than European countries did. They didn't fight over territory but instead to prove their courage, and so Plains Indian war parties rarely fought to the death and almost never destroyed each other's villages. Instead, they preferred to count coup (touch an opponent in battle without harming him), steal a foe's weapon or horse, or force the other tribe's warriors to retreat. So traditional Arapaho enemies like the Shoshones and Kiowas were not actually that unfriendly to them. In fact, it was the Shoshones who let the Northern Arapaho tribe live with them when they asked for help. moccasin What are Arapaho arts and crafts like? Arapaho artists are known for their quill embroidery and beadwork art, which they used to decorate clothing, moccasins, bags, and even their tepees. Here are some more photographs of Arapaho beadwork. What kinds of stories do the Arapahos tell? There are lots of traditional Arapaho legends and fairy tales. Storytelling is very important to the Arapaho Indian culture. Here is a story about Nihancan the spider trickster. Here's a website where you can read more about Arapaho mythology. Religions are too complicated and culturally sensitive to describe appropriately in only a few simple sentences, and we strongly want to avoid misleading anybody. You can visit this site to learn more about Arapaho mythology or this site about Native American spirituality in general. Friday the Arapaho Boy is a fun book for kids, based on the true story of an Arapaho child. You may also enjoy Full Moon Stories, which is a collection of thirteen legends retold for kids by an Arapaho writer and illustrator. If you want to know more about Arapaho culture and history, two good books are Arapaho Native Americans (for younger kids) and Tell Me, Grandmother (for older kids). You could also read this interesting biography, Little Raven, Chief of the Southern Arapaho. Another excellent history book is The Cheyenne and Arapaho Ordeal, but because the Arapaho tribe was the victim of a terrible massacre in 1864, this and other books covering the 1800's may be too intense for younger kids. You can also browse through our Native American library site for more good book recommendations. Thanks for your interest in the Arapaho Indian community and their language! An overview of the Arapahoe people, their language and history. Arapahoe language samples, articles, and indexed links. Related links about the Arapahoe tribe past and present. Would you like to help support our organization's work with the Cheyenne and Arapaho languages?